"One of the Most Haunted Small Towns in America!" 20 years of Alton Hauntings Tours! 2019 SPRING & SUMMER SEASON (APRIL- AUGUST) TOURS NOW AVAILABLE! SPECIAL EVENTS FROM ALTON HAUNTINGS! Join Troy and Lisa from American Hauntings for a fun-filled night of cold chills as we travel the Great River Road in search of spirited tales! The night begins with dinner at the Bluff City Grill in Alton, followed by a trip along the Mississippi River to Grafton, which will include the history and hauntings of the region’s, eerie locations and spooky stories. In Grafton, we’ll be stopping for drinks at a legendary location and then the ghostly tales continue as we return to Alton, with a special final stop in town at the mysterious Mineral Springs Hotel. $ 48 Per Person | CLICK HERE FOR RESERVATIONS! SPECIAL EVENT: AN EVENING WITH THE BLACK DAHLIA! Join Troy Taylor on July 13, 2019 for dinner at the Mineral Springs Hotel, followed by “Fallen Angel,” the the true story of Elizabeth Short, the infamous “Black Dahlia,” which offers an in-depth look at her murder, which has become one of the most famous unsolved crimes in American history! Don’t miss out on his special event! CLICK HERE FOR RESERVATIONS! Join us for a special event tour from Alton Hauntings! Our DINNER AND SPIRITS experience starts at the Bluff City Grill in Alton, Illinois with a full dinner, followed by guided ghost hunts at two of Alton's most haunted locations! After dinner, you'll hear about Alton's history and hauntings and why it's known as "one of the most haunted locations in America." We'll then depart for our spirited search for evidence of real-life hauntings at two different haunted places -- the confines of the Underground Railroad station beneath the former Enos Sanitorium and the First Unitarian Church! It's going to be a night you won't soon forget! CLICK HERE FOR RESERVATIONS! WELCOME TO ONE OF THE MOST HAUNTED SMALL TOWNS IN AMERICA! Looking for the real story of why Alton, Illinois, is known as one of the most haunted small towns in America? Come along on one of the award-winning Alton Hauntings Tours! Based on the book by author Troy Taylor, it has been called the "most authentic" tour in the region and after almost 20 years, we take you behind the scenes of the most haunted places in town. According to legend, author Mark Twain once called Alton a "dismal little river town," largely thanks to the dark history that the city had already endured prior to its heyday as a thriving river port. From those days, through the early 1900s, Alton saw more than its share of death, disease, disaster, violence, murder, and even the scars of the Civil War. Today, come see how the events of the past have created the hauntings of what is now being called "one of the most haunted small towns in America." Our tour is an entertaining, often spine-tingling trip back in town to discover the true story of why our little town has become so haunted over the years! See the calendar for upcoming dates and join us on the eerie streets for Alton for a tour! Most Alton Hauntings Tours are 3-hours in length, unless noted otherwise. Different tours run all-year-around. Watch the schedule for upcoming dates. From various locations. Be sure to check your confirmation for departure location! BOOKS, SHIRTS AND MYSTERIOUS MERCHANDISE IN ALTON! Stop in at the American Hauntings Vault and stock up on books by Troy Taylor — author of Haunted Alton and dozens of other books on ghosts, crime, and the unexplained! In 1998, Troy opened his first store in the city and after a number of years away, has returned with the "American Hauntings Vault" in the Mineral Springs Hotel, located at 301 East Broadway! The Alton Hauntings Tours are based on the best-selling book by author Troy Taylor,HAUNTED ALTON. The book includes an in-depth look at all of the locations on the tour, plus the detailed history of Alton and the surrounding region. It's a chilling look back in time at the strange tales, unsolved mysteries, and many ghosts of the Alton area. It's the perfect companion to the tour! Click on the book to get an autographed copy! ALTON HAUNTINGS WALKING TOURS: Offered in the spring, summer and fall months, the award-winning walking tour is a 3-hour ghost experience that explores the old downtown of Alton, going into several different locations during the tour. We also offer the extended GHOST HUNTER'S TOUR, which includes an extra hour and visits locations that are not included on the regular tour. ALTON HAUNTINGS BUS TOUR: Offered in the fall only, the bus tours visit all of the sites that are included in the walking tour -- and we do get on and off the bus at many locations -- but also travels to haunted places in other parts of the city. COMING THIS FALL! ALTON HAUNTINGS SPIRITS OF THE CIVIL WAR TOUR! Discover the history and hauntings of the Civil War era in Alton with this bus tour of eerie and heartbreaking sites! Includes the former prison, underground railroad sites, burial grounds, and more! DINNER AND SPIRITS: GHOSTS OF THE RIVER ROAD DINNER TOUR: Hosted by author Troy Taylor, this bus tour travels from Alton to Grafton and includes stories of ghosts and unsolved mysteries along the way. The tour departs from the Bluff City Grill in Alton and after dinner, we travel to Grafton on a history and hauntings tour you won't forget! We'll also include a stop at the mysterious Mineral Springs Hotel! We offer this tour all year around, with winter, spring, and fall dates for the Halloween season. It's one of our most popular tours and sells out fast, so be sure to book your dates far in advance! 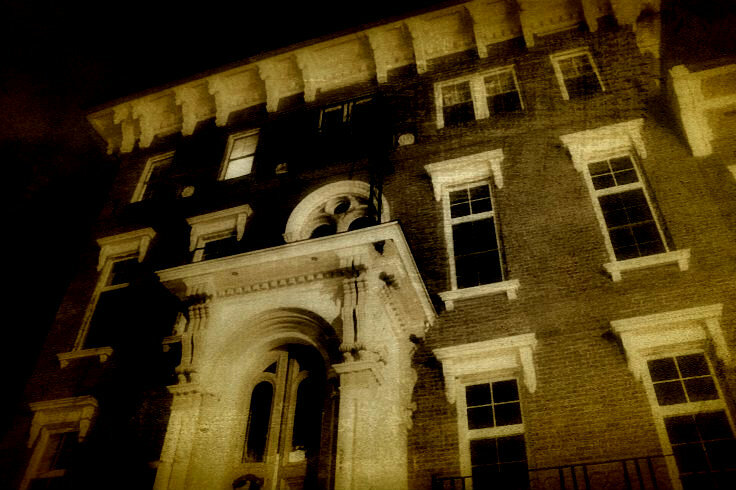 DINNER & SPIRITS WITH ALTON HAUNTINGS: One of our newest tours from Alton Hauntings! The Dinner and Spirits Tour Experience begins with dinner at Alton's Bluff City Grill, followed by a search for the spirits during guided ghost hunts at two of the city's most haunted locations. Bring along your cameras and ghost-hunting gear — or just your courage — and discover the spirits that linger in the city. Want to experience Alton's haunts first-hand? This is your chance! PRIVATE TOURS: Alton Hauntings also offers private walking tours and step-on guide tours for visitors who bring in buses or have their own vehicles. CLICK THERE TO GET MORE INFORMATION ABOUT PRIVATE TOURS or call us at (217) 791-7859. Is The Walking Tour actually a Walking Tour? Yes, is the walking tour that we have been offering since 1999, but it is NOT non-stop walking for 3 hours. The tour is actually only about 15 blocks of total walking but the time on the tour is spent at and inside of the locations on the tour. We stop frequently and the tour goes at a leisurely pace, so it's not a strenuous evening. We also offer bus tours for those who want to see the sites, but don't want to walk. Do We Give Out a List of the Places that we Go on the Tour? No, unfortunately, we don't do that -- for several reasons. First, we like our guests to be surprised, plus we often change the tour, so it can occasionally vary from night to night. Is this the REAL "Haunted Alton" Tour? Yes, this is the only tour in the area that is actually based on the bestselling book, Haunted Alton, and was created by the author, Troy Taylor, in 1999. Yes, all of the tour tickets are sold on a first come / first served basis, which means that the tickets have to be purchased in advance, just like tickets for a concert or event. Once you buy them, they are yours and tickets are non-refundable. Will I be sent tickets in the Mail? No, when you register online, you will be emailed a confirmation form, which you can print out and bring to the tour with you. Since we only accept reservations online, everyone will receive their confirmation via email. Thanks! Can I get my money back if I decide to cancel or don't show up? Sorry, but no, ALL reservations are non-refundable, just like any concert or event. All of the tours are sold on a first come / first served basis and we cannot re-sell reservations that are not used. Once you purchase the reservations, they're yours. You can give them away or sell them to someone else, but we don't offer refunds. We will re-schedule you if you cannot make the date for some reason, but we do require a 48 HOUR notice to change the date. Re-schedules must be made via email and we will be happy to credit you for a future tour.